Many women turn to various alternative approaches for the treatment of fibroids which are also known as myoma. Acupressure is one of the approaches that some women incorporate into their natural fibroid treatment methods. If you are interested in what this holistic approach can do for your tumors, the following is some information on this approach as well as the top 3 acupressure points for fibroids treatment. Acupressure is also known as “shiatsu” by the Japanese and represents the application of finger pressure on specific areas of the body in order to restore healing and well-being in the body or to prevent various diseases. 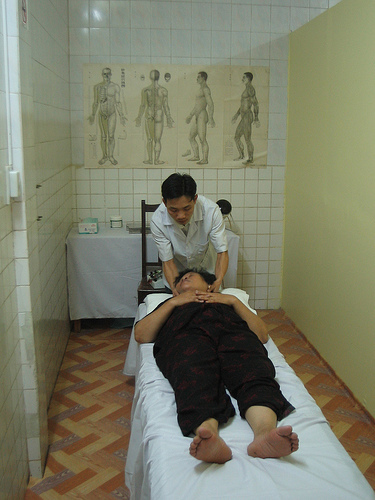 Acupressure massage is an Eastern practice that is based upon the belief system that all diseases or other issues in the body are the result of blockages of life-force energy along the detailed energy map of the human body. This approach states that there are precise channels (meridians) in the human body through which life-force travels in order to transmit energy to various areas of the body. Sickness and disease results from blockages along these channels and the finger pressure applied to the skin that is the cornerstone of acupressure is supposed to unblock these areas and health and well-being restored. While this approach does not specifically address fibroids, this condition still results from an imbalance or dysfunction of some form in the body and applying the acupressure points for fibroids can help to relieve the various symptoms of uterine fibroids such as pain, heavy bleeding and discomfort. While you can perform acupressure on yourself which will cost you nothing, it can also be pleasurable to have someone else perform this on you. They of course have to be knowledgeable about the acupressure points for myoma. The following are the top 3 acupressure points for fibroids. There are many others as well that are not covered here. Acupressure for heavy menstrual bleeding which can lead to anemia involves the stimulation of points along the spleen meridian. The stimulation in this area is useful because this area affects blood formation and is the root of menstrual issues. In order to perform acupressure in this area, you should sit upright in a chair or against a wall. The first acupressure point is four finger-widths above the inner ankle bone. Hold this point with the right hand for up to 3 minutes. This focuses on the points that help balance the bladder meridian. Unblocking this meridian restores energy in the female reproductive tract which helps to relieve pelvic tension, PMS symptoms as well as urinary issues. To perform this exercise, sit upright with your back against a wall. Perform each exercise for up to 3 minutes. Your left hand should be placed 1 inch above the waist on the left side of the spine. Your right hand should be placed behind the left knee. Keep the left hand in the same position but place the right hand on the center of the back of the left calf which should be slightly below the largest part of the calf. Keep the left hand in the same position while placing the right hand just underneath the ankle bone on the outside of the left heel. Keep the left hand in the same position at the waist while the right hand holds the front and the back of the left little toe at the nail. To begin, lie on the floor with your knees raised at 90 degree angles with your feet flat on the floor. Place the towel on the spine between the shoulder blades. With your arms crossed over your chest, press your thumbs against the left and right inside of the upper arm. Hold for up to 3 minutes. Using the left hand, apply pressure to the base of the breastbone while the right hand is pressed on the point at the base of the head (juncture of the skull and spine). Hold for up to 3 minutes. With the fingers interlaced, place them just below the breast while the fingertips press against the body. Hold for up to 3 minutes. Next, move the towel along your spine to your waist. Lastly, place your left hand at the top of the pubic bone and press down while the right hand holds the acupressure point on the tailbone. These are just a few acupressure points for fibroids to help relieve many of the symptoms of uterine fibroids. Make sure that the room is quiet and warm and that your hands are clean with trimmed nails to prevent injury. Apply pressure very slowly using the tips or balls of your fingers while ensuring that your hand is in a comfortable position. Push harder if you feel more tension or resistance in an area. If your hand starts to feel tired or tense, release some of the pressure. Breathe gently as you perform each exercise. If an acupressure point feels tender, it means that there is an energy blockage on that point and the tenderness should slowly dissipate as pressure is applied. You may also have a feeling of energy radiating from this point into the body but do not be concerned if you do not have this feeling. For more tips on how to eliminate fibroids naturally besides using acupressure, click here. For more effective natural ways to get rid of fibroids and the symptoms for good, you need the step by step holistic guide Fibroids Miracle. Find out more about this has helped thousands of women around the world become fibroids free using natural methods only here. Next Fibroids And Apple Cider Vinegar – Will This Work To Shrink Fibroids?